One of the most powerful exhibits I’ve ever experienced about the Holocaust is at the site of what was once the Auschwitz-Birkenau death camp in Poland. Here, in the installation by Yad Vashem at Block 27, the deeply human story is told through flickering film footage of Jews living ordinary lives in Europe before World War II: a young girl ice skating, children singing and dancing. The story is also told through video testimony of Jews who survived, through giant pages listing the millions of names of those who didn’t, and through drawings on the walls. Viewers are left with the gut-wrenching reality that the Shoah destroyed real people with real names and real lives. That some aspects of the exhibit were technologically sophisticated and others were devoid of technology is entirely incidental to the experience. In the sphere of remembrance, technology should never be a “thing” in its own right. Stories, really, are the thing. They are at the heart of how we talk to each other, share memories, transmit understanding. Technology has always been in service of that human function. It is a utility to help tell our stories and deliver our content. Within Echoes & Reflections, for example, visual history testimonies from survivors and other witnesses to the Holocaust, were carefully curated from USC Shoah Foundation’s Visual History Archive, and embedded within each classroom lesson and theme to bring the history to life with real people who lived through this event. This month and next, as students return to school, I ask educators to bear this message in mind. Students from toddlers to twentysomethings exist in a virtual matrix of gadgets, video games and social media accounts. This is natural. Media, like fashion, is ever changing. The trick is to use the latest technology to meet the students where they are, and to deliver to them stories that illuminate. It was with this intention that USC Shoah Foundation has embarked on several technological innovations. Our 2016 documentary, “The Last Goodbye,” is the first virtual-reality film to take audiences through a concentration camp. The power of it lies not in the capability to capture a scene in 360 degrees, but in the immersive experience of being in the Majdanek death camp with the narrator, Pinchas Gutter, the only member of his family of four to survive the camp in Poland. Adding to the authenticity of the experience is the fact that Gutter was filmed not on a green screen in some studio, but on site. When he is standing at the door of the gas chamber where his sister was murdered, there is no escaping the terrible truth of what that place means in his memory. In this same spirit, we have recorded more than a dozen testimonies using a technology we developed that allows users to interact with the survivors on a screen. (The interviewees were filmed volumetrically, meaning it will one day be possible to reconstruct their images into holograms.) 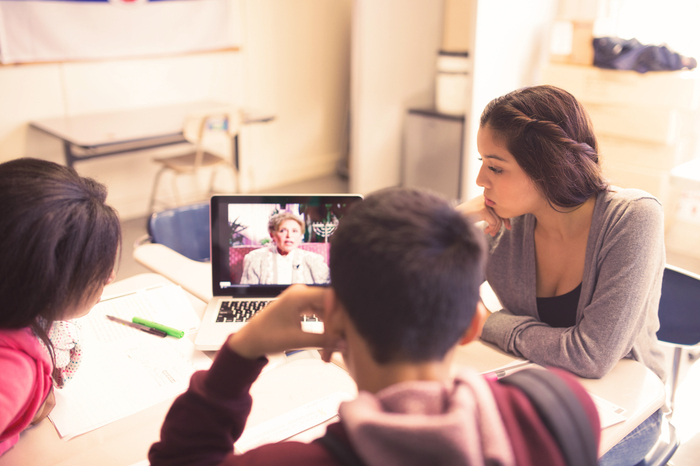 Called Dimensions in Testimony, these interactive biographies enable viewers to be guided by their own curiosity; to take an inquisitive approach to learning a survivor’s story, in the same way we do when we see a Holocaust survivor speak to a classroom. Technology is not the message. It is what our audiences experience that really counts. About the author: Stephen D. Smith, PhD, is the Andrew J. and Erna Finci Viterbi Executive Director Chair of the USC Shoah Foundation. In 1937, Lambert immigrated to the United States where, determined to leave her German past behind, she Americanized her name to Margaret. That year, she won the US women's high jump and shot put championships, and in 1938, she again won the US high jump. She resigned from her career in sports after the outbreak of World War II. In recent years the German track and field association has worked to make amends. In 1995, a sports complex in Berlin was named in Lambert’s honor. She and her husband were Germany’s guests of honor at the 1995 torch lighting at the Olympics in Atlanta. And, in 1999, the Laupheim stadium that Lambert had been banned from in the 1930s was officially named after her. Lambert's 1936 German national record was officially restored in 2009. This work has never been so critical. Can you imagine my disgust as I read articles about Eric Hunt (a Holocaust denier known for attacking Nobel Peace Prize winner Elie Wiesel) who is creating a virtual "Holocaust Hoax Museum” that will dispute the Holocaust happened? It seems inconceivable that in 2015 Holocaust imagery and phrases like, “Hitler Should Have Finished the Job” are being used on college campuses and to desecrate synagogues nationwide.